Hopes for an improved train service through Brigg Station appear to have improved slightly following a meeting between the ‘Friends of the Brigg Line’, Brigg Town Council and Alex Hynes, managing director of Northern Rail, which has the present franchise for the line. 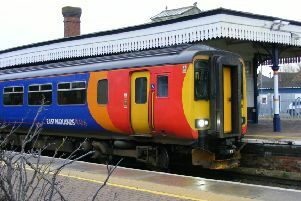 “The support group ‘Friends of the Line’ are doing an excellent job at trying to improve the service and are pressing for an extra train on Saturdays each way to add to the existing three trains each way,” said Coun Mike Campion, who attended the meeting on behalf of the town council. Coun Rob Waltham, who also attended the meeting at the station site described the meeting as ‘very productive’. It was agreed by all present the Saturday only service was inadequate, as was the atmosphere at the station. There is also concern at the footbridge, which provides no access for disabled rail travellers or pram users, but the renewal of the franchise next year will add fresh impetus to the campaign for a better service and station improvements.